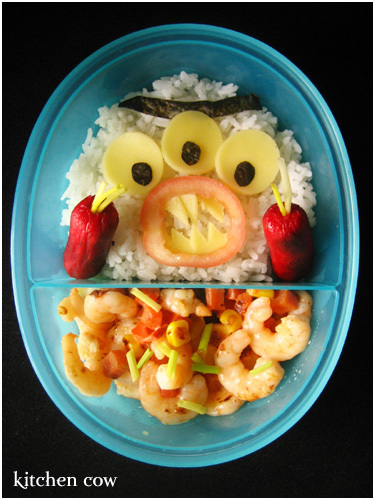 When Sea Monstaaars are your Bento! The previous bento reminded me so much of those mutant multiple eyed fishies on The Simpsons, as well as that giant mutant 3-eyed fish on Powerpuff girls. So it was only natural I’d try it next. This was actually my Halloween bento, but I’m on a posting backlog I guess. Still, monsters can stir up trouble whenever they choose. Mister Sea Monstaaar is made of cheese and nori eyeball cut-outs, a cheese and tomato mouth and cocktail hotdog hands. But since he’s a monster, he’s no fun just having hands. So I gave him spring onion nails! So he can poke your eyeballs out. All the more for him! Bwahahahahahaha! To go with my rice, I did a shrimp stir-fry with corn and carrots, spring onions and some cream. Decent shrimp dish but it’s not unforgettable enough for me to write the recipe down. One reminder when preparing similar bento though, don’t keep your face too close to your lunch because you never know when Sea Monstaaars may decide to poke your eyeballs! 2 Responses to When Sea Monstaaars are your Bento! I love the nails – that’s what makes him FIERCE!